This latest model of the fantastic Colt Python features dual ammo ability, meaning that you can fire either BBs with the standard plastic magazine, or Pellets with the metal magazine. A super flexible pistol for those who require the ease of BB plinking, but the accuracy of Pellet target shooting in one pistol. The frame of this model is constructed from high density polymer which is robust and strong, and all the working parts such as the hammer, trigger, and indexing system are constructed from metal for many years of reliable service. The barrel is also rifled steel which ensures great accuracy with the pellets. The CO2 capsule is concealed within the grip, of which one half removes to load the co2 capsule. There is an in built allen key into the grip to load and unload the Co2 capsule meaning no more lost allen keys. 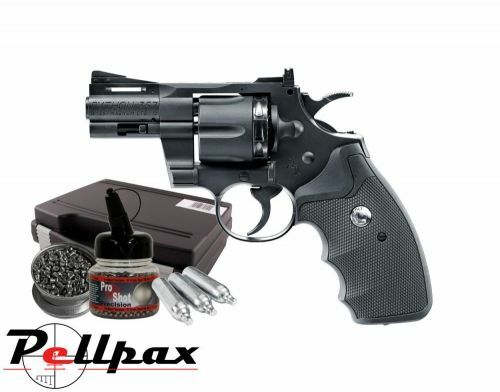 As well as this pistol we are including an ML foam lined pistol case, 10 x CO2 Capsules, a tub of 1500 4.5mm Steel BBs, a tin of Proshot Practice .177 pellets, and a pack of our targets to get you going. Everything you need to start shooting as soon as it is delivered.